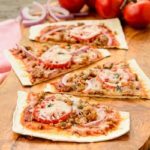 Sausage Onion Flatbread Pizza is a quick and easy appetizer or main dish. Spicy Italian sausage, red onion, tomato, and cheese are a marvelous combination. Brown sausage in a skillet over medium-high heat, stirring and breaking up while browning with a spoon or spatula. Remove from heat. Spread sauce on flatbread. Sprinkle sausage on sauce. Top with onion, tomato, and cheese. Bake for 7 to 11 minutes, or until cheese is melted and starting to bubble.